Gerard & Kelly, Schindler House, 2015, Los Angeles. Photo: Matthu Placek. 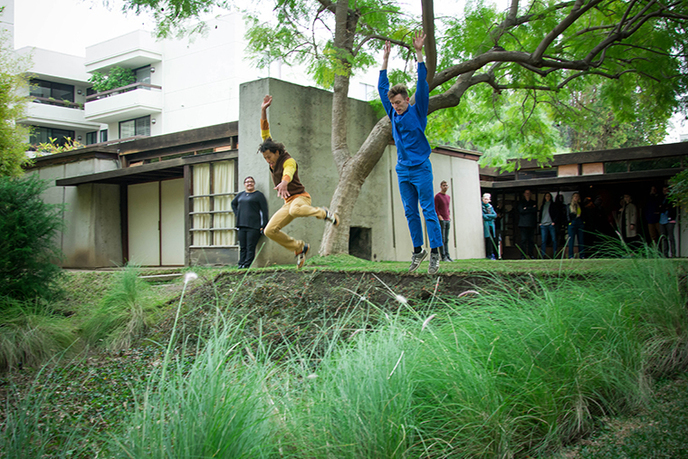 Modern Living is a new performance artwork by Gerard & Kelly brought to life in collaboration with LA Dance Project. Modern Living explores themes of queer intimacy and domestic space within the legacies of modernist architecture. 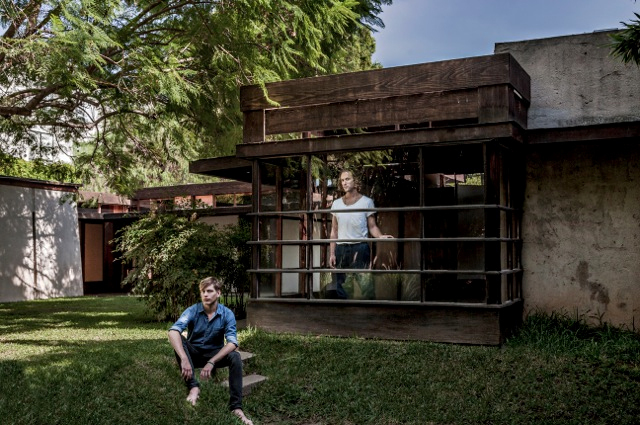 The project unfolds in two chapters, beginning at the Schindler House in West Hollywood, California, in January 2016 and continuing at The Glass House in New Canaan, Connecticut, on May 13 and 14, 2016, and brings into dialogue two iconic homes that were lived in by the architects who built them. The project examines how the sites' interventions into traditional codes of domestic architecture produced notions of family and ways of living radical for their times. The Glass House famously sheltered its architect Philip Johnson and his partner, David Whitney, in a relationship that preceded the Stonewall rebellion. The Schindler House, built in 1921 by Rudolph M. Schindler, housed two families who shared a kitchen, garden, and other common spaces—an early example of communal living. Modern Living addresses incomplete chapters in the history of modernism. The Glass House and the Schindler House have long been admired for their contribution to architectural history, and the everyday stories of relationships struggling to modernize within the homes are rich yet still under appreciated. For the past five years and through a series of performances, videos, and installations, Gerard & Kelly have interrogated the couple as the paradigmatic sign of intimacy. With Modern Living, the artists extend this inquiry to the site of the modern home. 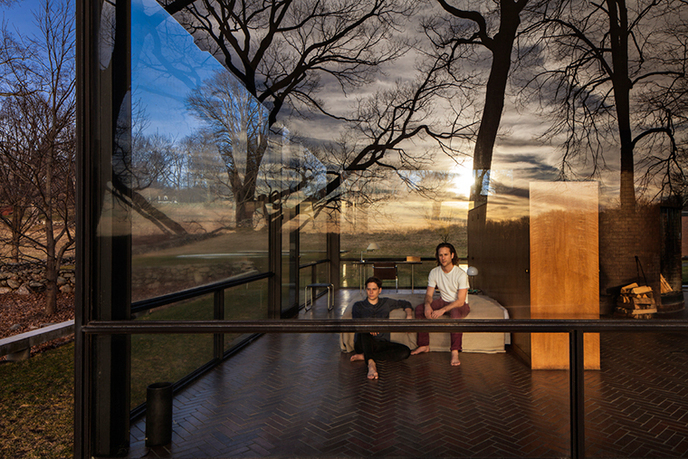 For The Glass House, Gerard & Kelly have composed a movement score for the nine dancers of LA Dance Project, who explore the rhythms of time throughout the location's interior and exterior spaces. Falling in and out of sync, the group investigates the livability of a queer space—its pleasures, tensions, and impossibilities. Gerard & Kelly (Brennan Gerard and Ryan Kelly) have collaborated since 2003. Working within an interdisciplinary framework to create project-based installations and performances, Gerard & Kelly use choreography, video, and sculpture to address questions of sexuality, memory, and the formation of queer consciousness. Their work has been exhibited at numerous institutions including the Guggenheim, New York; the New Museum, New York, the Hammer Museum, Los Angeles; and The Kitchen, New York. Gerard & Kelly have received numerous recognitions for their work, including the National Dance Project grant from the New England Foundation for the Arts (2015) and the 2014 Juried Award from the New York Dance and Performance Awards, also known as the Bessies, in addition to grants from Art Matters (2014), the Graham Foundation for Advanced Studies in the Fine Arts (2014), and the Van Lier Fellowship (2010). Gerard & Kelly completed the Whitney Museum Independent Study Program in 2010, and received their MFAs in 2013 from the Interdisciplinary Studio in the UCLA Department of Art.